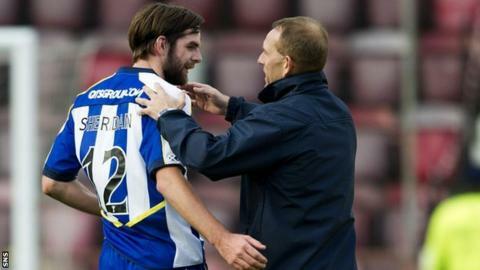 Kilmarnock manager Kenny Shiels hopes hat-trick scorer Cillian Sheridan can match the scoring exploits of former Rugby Park player Conor Sammon. Sheridan's treble put Kilmarnock on their way to a 3-1 win at Hearts. Sammon netted 18 times for Killie before joining Wigan Athletic midway season 2010-11. "I'm not putting pressure on the boy, but there's similar things happening here that happened with Conor," Shiels told BBC Scotland. "It's up to me to make sure that the development programme for each individual player helps each player to fulfil his maximum potential. "The mental develpoment, the physical development; all of that is part of the programme that he's on at the moment and I'm seeing it evolve straight in front of me." Shiels was delighted with the three goals from the Irishman who left CSKA Sofia in the summer after spending last season on loan to St Johnstone. "It was fantastic," he said. "When you're playing with confidence, the ability's in there. "He's got ability and we want to nourish that and develop it and Kilmarnock Football Club, hopefully, will proft from that." A second straight league win moved Shiels' side up to third in the Scottish Premier League. "League tables don't formulate until 16 games in my book, so I don't look at league tables just yet because it's too early to form a league table and feel that we've done well," added Shiels. "To be where are, in terms of having won our last two games against clubs like Hearts and St Mirren, is a fantastic achievement. "I was very pleased at our organisation because it was the organisation that won us the game. I thought we were composed and controlled. "We were playing against a massive club in their own patch so, as the home team, they're going to press forward but we were in good control of the game."